"Business Gate from Karviná caught the audience attention during the international worskhop in Poland focused on entrepreneurial education"
ECMT+ partners from Czech Republic, School of Business Administration in Karviná, published an article in the news portal of Silesian University in Opava about the first ECMT+ Teacher Workshop held in Poland, Poznań 14. - 15 December 2017. The article summarises the content of the workshop and the aim of the ECMT+ project. 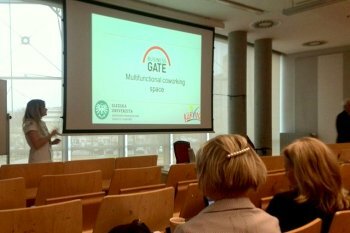 It the workshop PhD candidate of the Department of Business Economics and Management Adéla Chromčáková presented the multifunctional coworking space Business Gate. The article was written by Lubomír Nenička, Ph.D.